UPDATED – After a helpful reader pointed out the potential risks of eating raw flour, please see the note at the bottom of the recipe if you want to bake your flour before using it in the dough. Today’s recipe is a bit of a weird one. It’s just cookie dough. One of the best parts about baking a cake is licking the spoon (and the bowl). Same goes for cookies. I always have to munch some of that raw dough before it goes in the oven. I’m pretty sure it’s a universal problem – you know you probably shouldn’t eat it, what with all the raw eggs and stuff, but you just can’t help yourself. 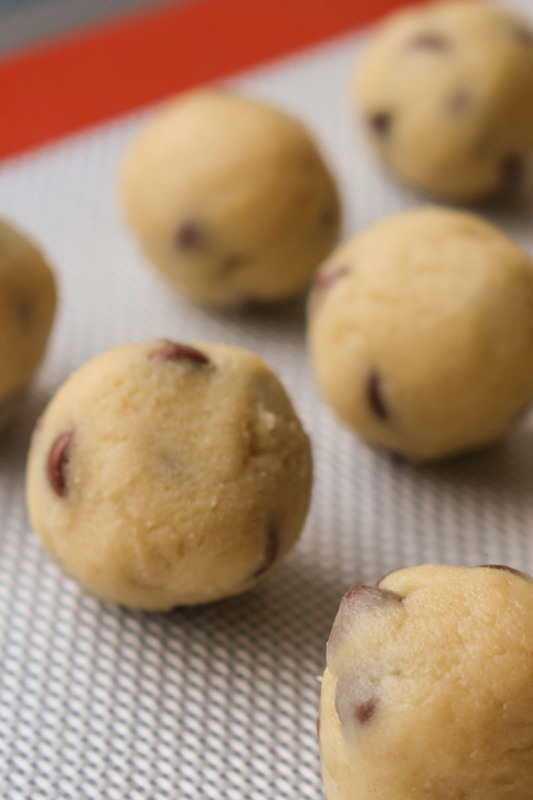 These cookie dough balls you see before you are completely egg-free. This does mean they would make hideous cookies, but instead of baking them you can just gobble them up raw. Bit weird? I’ve got plans for these balls of dough, and it involves stuffing them inside some cupcakes. More on that later. But you could also dip them in some melted dark chocolate and have yourself some cookie dough truffles. Or make some home-made vanilla (or chocolate) ice cream and swirl some of this dough right on in there. Who needs Ben & Jerry. The recipe for these edible cookie dough balls is adapted from the double chocolate chip cookies I shared with you back in February. Sans cocoa powder. 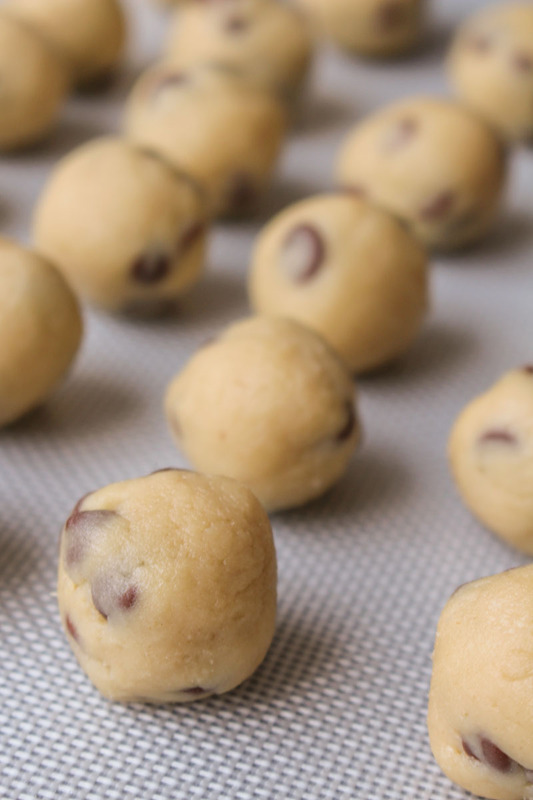 Those cookies are so fudgy because the dough itself is the thickest dough around, which is exactly what makes it perfect for these edible cookie dough balls. You don’t want them to melt apart in your hands, after all. It is still best to store these doughy balls in the fridge before you eat them, although they will keep at room temperature – they will just be a bit softer. Still bloody delicious though. If you have an amazing cookie recipe that you want to remove the egg from, then a top tip is to add 2-4 tablespoons of milk to the dough for every egg you are looking to replace. The milk will keep the dough balls together, without any risk of salmonella. Because that’s one thing you don’t want to have in your kitchen. 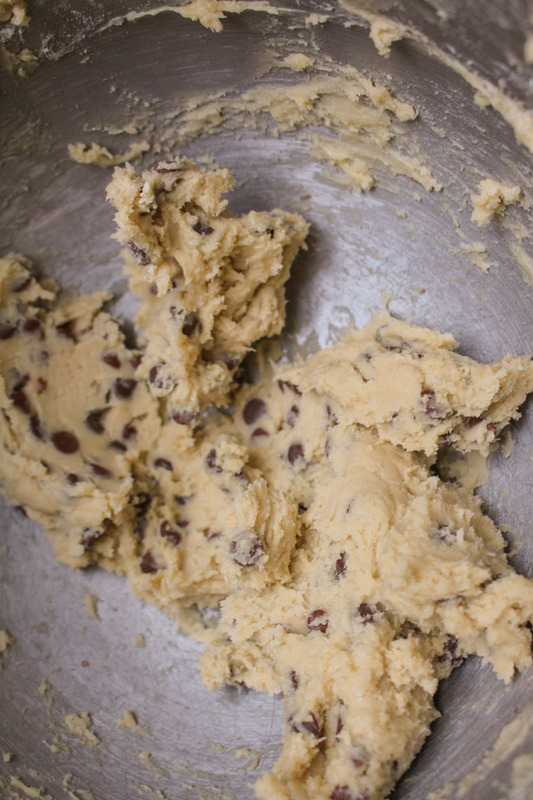 This cookie dough contains no eggs, so is safe to eat raw. Dip dough balls in melted chocolate for some delicious cookie dough truffles. Add the milk, one tablespoon at a time, mixing well between each addition. Add the vanilla extract and mix again. Add the flour and salt to the bowl, and mix gently until just combined. Put the chocolate chips in to the bowl and mix gently until well distributed. The dough can either be rolled into balls (and dipped into melted chocolate), or eaten with a spoon. To avoid any potential risks with eating raw flour, the flour can be baked beforehand to kill any bacteria. To do this, spread the flour out on a baking sheet and bake in a preheated 180°C / 350°F (160°C fan) oven for 10 minutes. And then use the baked flour in the above recipe. The cookie dough doesn't need to be refrigerated - although it will remain firmer if kept in the fridge. It is best to eat the dough within 2-3 days. The dough can also be frozen, for 2-3 months. Just defrost at room temperature. If we get an ice cream maker off the wedding list you need to make cookie dough ice cream with these. Maybe with some caramel sauce and fudgy pieces. And hazelnuts. Isn’t it dangerous to eat dough with raw flour in it? There is a small risk with raw flour, but if you’re concerned at all then the best thing to do is spread the flour on a baking tray and bake for 5 minutes in the preheated oven. This should kill any bacteria in there. Personally I’ve been licking the spoon/bowl after baking for almost 30 years and I’ve never been sick, so I don’t bother with this step. But I will amend the recipe above to add this in to avoid any nasty surprises! Thank you ? Thanks Charlotte. I too have been dipping into raw cookie dough for over 50 years without any issues. I was just wondering with all the warnings they have today. Can this cookie dough really be left out of the refrigerator at room temperature for 2-3 days if it contains fresh milk? I’m thinking of making some for a children’s birthday party & want to make sure it’s safe to be left out at room temperature. Hi Kat. It should be fine – the sugar stabilises the tiny amount of milk, so it won’t spoil. Kind of like how buttercream can be left at room temperature even though it has butter in it. Make sure to bake the flour before using it though to be extra safe seeing as kids are involved.